One of my favourite ways to spend time online is browsing childrens clothes websites and cooing over the latest trends and styles for little ones. Of course this means I usually up spending a fortune but I also just enjoy putting together outfit ideas in my mind, and getting inspiration on how to dress the kids for the coming months. I adore fashion but since becoming a Mummy my focus has definitely shifted to childrens clothing rather than to items for myself! I love discovering new brands and websites too - today I've been browsing online and I've put together some little Looks for Little Ones that I just adore for the coming months! For Tyne I just love the smart look - checked shirts galore and smart ties and bow ties are adorable, I love anything with braces and for more casual days then stripes and light blues and greys are a must for me! One thing I absolutely cannot stand is brightly patterned clothes, neon colours and big pictures of dinosaurs/monsters/trucks - I find so many little boys clothes feature these things and the look just doesn't appeal to me and doesn't suit Tyne either. Each to their own of course, but I personally love to see little boys looking just as smart and stylish as little girls can! For baby boys, I LOVE the traditional/vintage look! I try not to dress babies in "proper" clothes like t shirts and shirts with trousers or jeans until they're at least 4 or 5 months old - I much prefer to keep them in "baby" clothes for as long as possible - after all, you get such a limited time for them to wear sleepsuits and knitted cardigans like these so I like to take full advantage of it while I can - there's a lifetime of shirts and trousers once this stage is over! Again, I'm not personally a fan of bright colours - I prefer the greys, beiges, whites, baby blues and a bit of navy and maybe some red stripes here and there. I love anything knitted on babies, and the more "vintage" the look - the better! 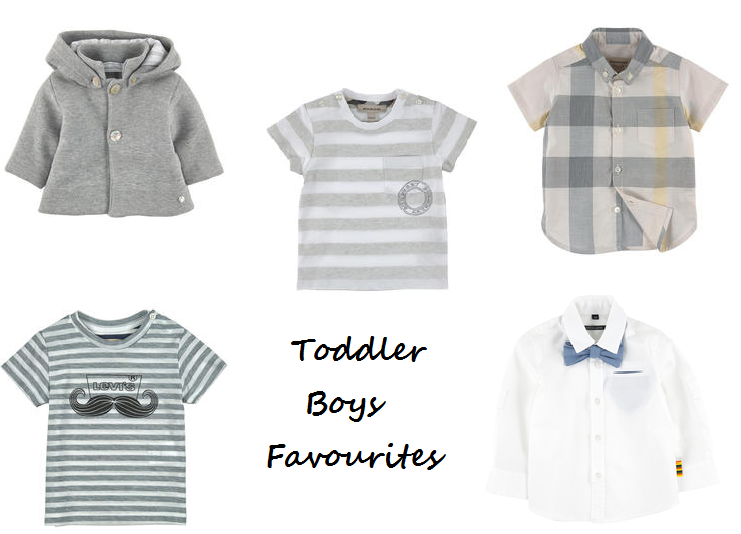 When it comes to looks for little girls, I tend to have the same taste as I do for boys - smart clothes in pastel colours or navies and reds are my favourites. I know loads of people will disagree with me and think I'm old fashioned, but I just don't think you can beat a dress with some pretty tights on a girl! And finally - baby girls! I just love little cardigans with delicate detailing, pretty summer dresses with floral patterns and my absolute favourite look for baby girls is the vintage style dresses and smock tops with matching bloomers! Adorable! I also think every baby girl needs at least one frilly tutu in their wardrobe! All of the looks above were put together from the Melijoe website, so do check it out for any of the above items and TONS more beautiful pieces.